Course outline: Students will learn to use dry and liquid glass enamel to screen print graphic designs onto an enamelled copper surface. You will learn to prepare a copper surface for enamel application, and how to fire enamel in a hot kiln. Students will have the opportunity to develop their own silk screen to use in their project, however designs on transparencies must be prepared before the class. Students will make one enamelled coaster, and will have the option of making a second smaller pendant with the same silkscreen design. There is no kit fee. Enamels, one copper coaster and one smaller copper shape will be provided for use during the class. Time permitting, you may be able to do additional pieces using solid copper sheets or stampings purchased from BeadFX (s50469, s42300, s26854 etc). Christine can advise on what copper stamping will work best for this technique. Prerequisite: Previous metal work and enamelling experience is beneficial, but not necessary. 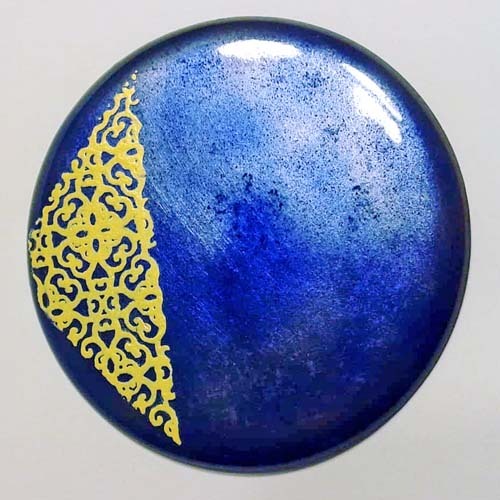 Technique: Glass enamel on copper. Students should bring a design that is less than 55mm in diameter. Student are welcome to create the design by hand on transparency using an opaque oil-based sharpie pen before the class. Alternatively, if a design is printed by computer onto a transparency, three copies will need to be made and stacked to ensure the design is lightfast. All lines in the design should be at least 1.5mm in width for best results. Students are welcome to bring any enamelling supplies they may have (including paintbrushes and ceramic palettes), however these are not mandatory. Tools and enamels will be available for use during the class. Students are encouraged to bring a notebook, and a lunch.